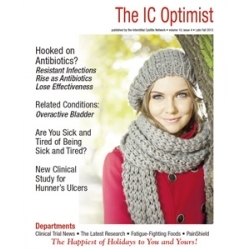 (1) Editorial: Eight Potential Causes of Bladder Injury - If you've wondered what could have triggered your IC symptoms, editor Jill Osborne offers a new editorial covering eight potential ways that the bladder can be irritated. The newest, number 8, could blow your mind! 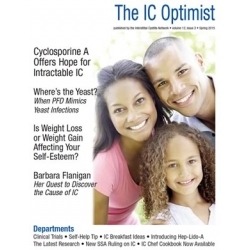 (2) The Latest Research - Why Are IC patients Deficient in Some Good Bacteria? - The MAPP Network’s discovery that IC patients have dramatically different bacteria levels not in their bladder but in their bowel casts a new potential villain in the IC story, the overuse of antibiotics, perhaps during childhood. While this may or may not explain the actual cause of IC, it could explain some of the related conditions! (4) Remarkable Patients With IC - Our newest remarkable patient with IC is Louisa Joy Wise, a world class australian folk musician. Louisa plays many instruments and has been a featured performer at music festivals around the world. If you love fiddle or celtic music, she's a new artist for you to follow! (5) Meet The IC Expert - Dr. Eliot Lander - Dr. Lander gives us an update not only on his research with stem cell therapy for IC but also on his novel use of liposomes to deliver Elmiron to the bladder wall. He's a true innovator! 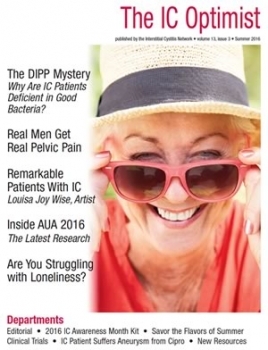 (6) Inside AUA 2016 - The annual American Urological Association conference always dedicates a portion of their program to IC and pelvic pain. We summarize the new research studies presented, including several that explore autoimmune dysfunction. 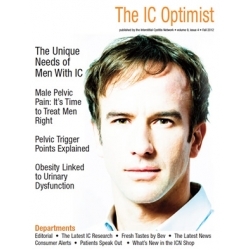 (7) Real Men Get Real Pelvic Pain - Dr. Jeannette Potts and colleagues again advocated for better diagnostic and treatment procedures for men struggling with urinary tract symptoms. The goal is to stop prostatocentric thinking and to teach urologists how to assess for pelvic floor dysfunction and injury. (8) Consumer Alert - IC Patient Develops Aortic Aneurysm After Taking Cipro - If you've taken or are currently taking fluoroquinolone antibiotics (i.e. Cipro, etc. ), the FDA no longer encourages their use for simple UTI's due to serious potential side effects including tendon rupture, central nervous system dysfunction and several other conditions. One patient shares one of the worst known complications, the development of an aortic aneurysm. (9) When Furniture Makes You Sick - In our self-help tip of the month, we focus again on the dangers of toxic chemicals when introduced into the home, particularly fire retardants. (10) The Latest Clinical Trials - Clinical trials offer patients the opportunity to try cutting edge therapies usually at no cost and in some of the best urology clinics in the country. We highlight two key studies currently seeking patients. (11) IC Diet Project: Savor The Flavors of Summer - Registered dietitian Julie Beyer offers several summer recipes that are, of course, IC friendly and filled with fresh, seasonal flavors including: Grilled Chicken Kebobs, Roasted Corn With Herb Butter, Low Acid Confetti Tomato Salsa, Pear and Honey Coleslaw, Creamy Macaroni & Broccoli Salad and Summer Milksahe Ideas! (12) Self-Help Tip: Summer Exercise Ideas - If you haven't gotten out and enjoyed these glorious days of summer, here are some IC friendly ideas! 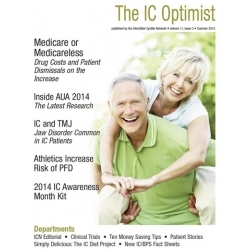 (13) 2016 IC Awareness Month Kit - Once again, IC Awareness Month begins in a few short weeks and we've included several ways that you can be involved. Remember, every patient voice is powerful. If you're not being treated well in your community or by your doctors, this is a great way for you to fight back!